Tracts4free.WordPress.com – free printable Christian tracts to download, free Christian posters, gospel posters and gospel tracts for evangelism and Christian outreach, witnessing tracts to download, Christian paintings, Christian articles, photos. Please use the materials on this site to freely spread the gospel. If you have any suggestions for distributing tracts, or any other witnessing tips or suggestions, please feel free to contact me. When choosing which Christian tracts to use, I suggest that you use the best, highest quality tracts that you can afford. If you have the money, or you can only distribute small numbers of tracts, then it is worth buying full colour, glossy tracts or booklets, cartoon tracts etc. We are ambassadors for Christ, and want to give the best impression possible, and be as professional as possible. If you can distribute large numbers of Christian tracts, and do not have money to spare, then this site, and others like it, offer a cheaper, but lower quality, alternative. 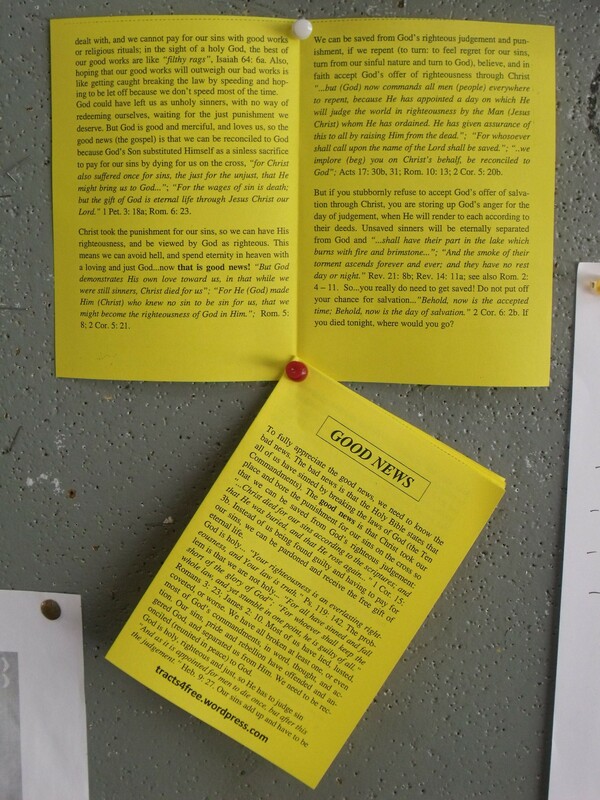 I have been placing tracts of all descriptions on notice boards for many years, and sometimes people remove or damage the tracts. If this is a big problem, it may be better to use cheaper tracts. Needless to say, I replace the tracts as quickly as possible. The tracts on this site look better, and stand out more on noticeboards, if they are photocopied on coloured paper, but this adds to the cost (it is best to use a light colour, otherwise the black writing is harder to read). However, quality is not just about appearance. Other factors such as doctrinal accuracy, simplicity and readabilty are also of utmost importance. Tract displayed open, with more tracts pinned below so that people can help themselves. Is the tract simple and easy to understand? Due to poor education or other reasons, some people struggle with reading and comprehension. Also, many people are busy, and won’t spend the time to read something long-winded, and some have a short attention span. For some people reading the tract, English may be their second language. It needs to be in plain English, and as simple and concise as possible. I think simple diagrams, pictures, illustrations and cartoons are also good, as the saying goes, “a picture speaks a thousand words”. Is the gospel explained well enough so that someone can get saved just by reading the tract? Would they understand from the tract that they are sinners in need of salvation? Is there a sinner’s prayer? Can they grow as a Christian from the resources provided on the tract? For example, is there space for a church stamp so that they can find a good church to attend? Are other resources such as web sites and books listed so that they can study/disciple themselves, in private if necessary, in countries where Christians are persecuted? Even if they choose not to get saved after reading the tract, would they at least understand more about Christianity, enabling them to make a more informed decision at a later date? Is the tract tacky, gimmicky, or offensive? Bear in mind however, that when some people hear the gospel/truth, they will be offended by it, (some do not want to accept that they are sinners for example) but this is an unavoidable necessity. Is the tract nice enough or interesting enough that they are likely to keep it? Will it stand out on a noticeboard? Could it contribute to littering? Is it biodegradable? Does the Christian tract rely solely on the bible (sola scriptura)? Is it a fair, honest and true representation of the gospel and biblical Christianity? Does it provide “all the counsel of God” (or “the whole counsel of God”) Acts 20:27, or does it present half-truths, spin, human wisdom, or some twisting or distortion of the scriptures or the issues? Does it present “the truth, the whole truth, and nothing but the truth”? What else could be important in the circumstances in which you are operating? Is there a better way of doing it? 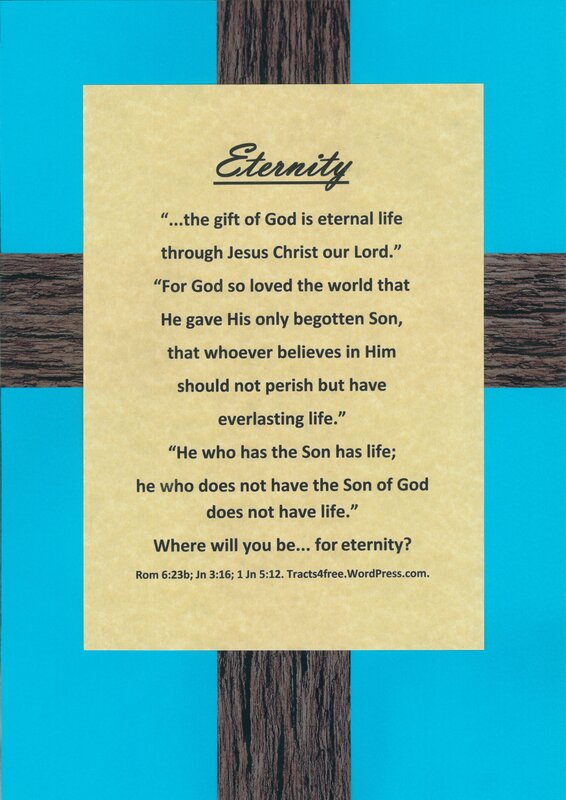 Fortunately, there are many excellent Christian tracts and gospel tracts available on the internet, and if none on this site are suitable, you should be able to find what you are looking for on one or more of the links. To go to the links page, click on the links button at the top of the page. 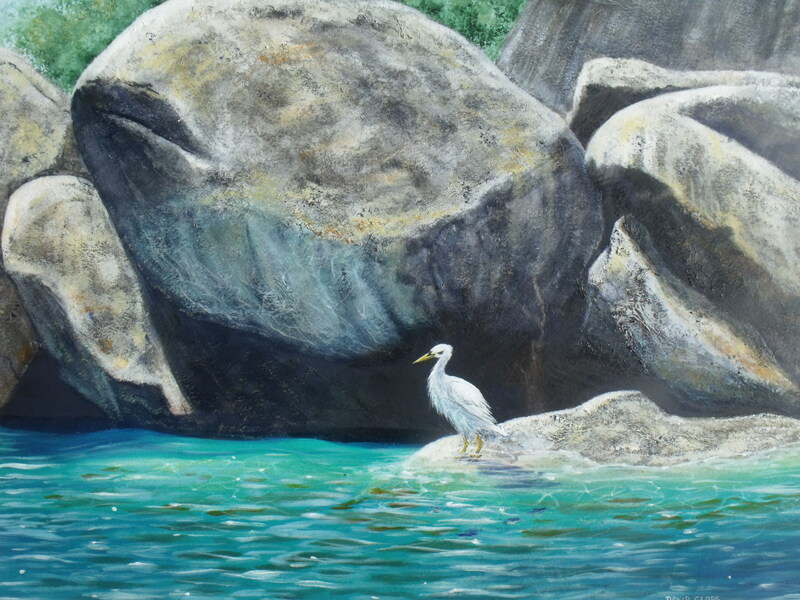 Unfortunately, there are not many Christian posters, or more specifically, gospel posters, available. There are some on this site, click on the “Christian Posters” button at the top of the page, or you could make your own. 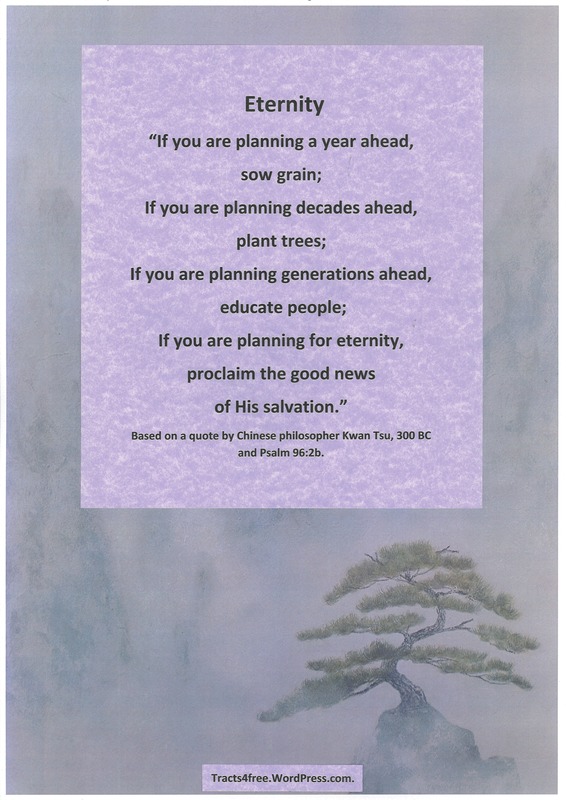 There is also a need for more gospel posters in a variety of languages, and web sites offering these for free. 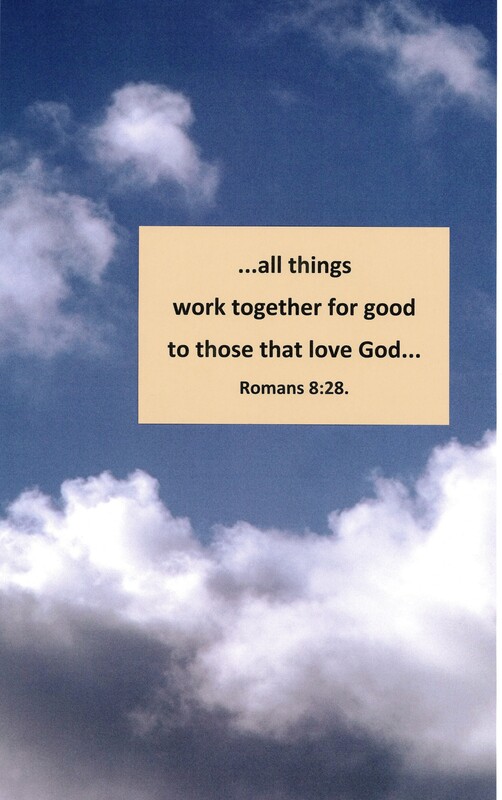 All things work for good…Romans 8:28. “Say not ye, there are yet four months, and then cometh harvest? If you are interested in overseas aid, alleviating poverty and reforestation, please visit my site http://reforestation.me.